Day 2 started early at 6:30 AM. This day was scheduled for a trek to the hidden waterfalls. After getting ready, we started for the place, at a good two hours distance. Once we reached the point where we had to start the trek, we realized that we needed to cross a river on foot and had no change of clothes. So with shoes tied on our backs or hanging from our neck, we started towards a village called Amanagatta. Very seldom have I got a chance to come across such natural beauty! This village and the path to it were in the middle of a tropical rainforest. 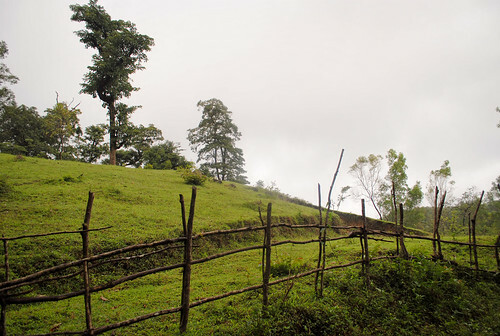 There was greenery all around and the slight drizzle added to a dramatic charm of the place. 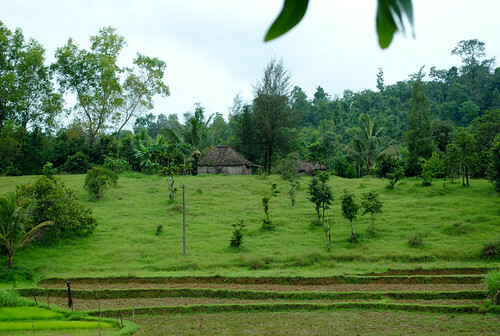 Once we reached the village, we could see vast terraced rice fields with people busy working, houses nestled in amazing greenery and grasslands as far as our sights could take us. The people were very friendly and slightly amused to know that we were doing all this walking for fun which was a kind of daily chore for them. While in the jungle, we came across an exotic flora and fauna, like the green snakes which some of us played with, a very lazy wiper which won’t move even if a lizard was sitting over it, a millipede which will roll itself into a hard ball when touched, and carnivorous mushroom type plants which would attract insects and then eat them. By this time we had stopped caring much about dirt, insects, leeches etc and were completely at peace with Mother Nature’s sights, sounds and smells. 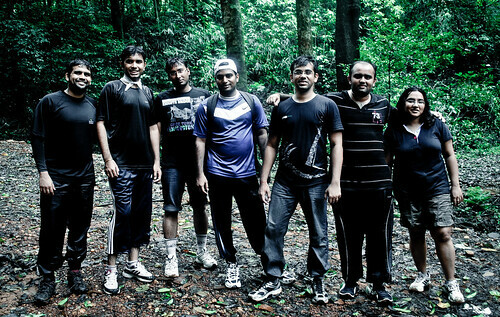 The last part of the trek was the most difficult one. We had to climb down the mountain towards the waterfall. It was raining, soil was loose and there was no trail, we had to crawl on our all fours, hold on to the roots of the trees for support and somehow survive to reach the destination, one slipped step and you are thrown into the deep gorge with water gushing at full force. I have never been so nervous and at high alert, each step taken could bring the difference between life and death. After nearly one hour of descent and with no mishap, we reached a point where we were standing under a relatively smaller waterfall which met the bigger one. Now we had to cross this small waterfall and get to the other side. After some five of us had crossed over, when one of the remaining stepped over a large rock, it suddenly gave way and went rolling down towards the others down there. For a second we thought that this was the end, but as if by magic, the rock got entangled in life saving roots and stopped midway along with the guy who was still over it! The view in front of us after so many ordeals was worth the effort. 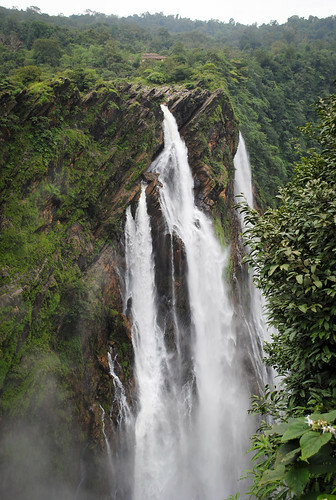 There lay a huge water fall, the big Daddy of even the Jog Falls, roaring down from a great height, bringing a massive volume of water with it. This fall is named the Burde (meaning the head) falls. The picture taken by us will never be able to depict the true majesty of this fall, but that’s the best we could take there, clinging to the rocks to save us from falling in the water. Jog Falls, falling from a height of 253 meters, is the second highest untiered waterfall in India. 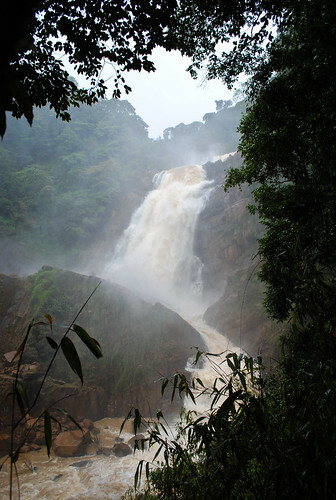 A segmented fall, it consists of four different falls called the Raja, Rani, Roarer and Rocket falls, named because of their respective characteristics. It was a magnificent view out there with the four streams falling down with full strength and creating clouds of mist. However the fact that this place was crowded to hilt and we had spent two awesome days away from population diluted our eagerness to stay there for long. So we started for our last destination- The temple at Ikkeri. The magnificent Aghoreshwara Temple at Ikkeri was built in the Hoysala- Kadamba style in the 16th century. Although the temple was ransacked by Tipu Sultan in his war against the local Nayaka rulers, the temple, by large, escaped major destruction and remains intact till today. This was perhaps my first brush with the Hoysala architecture and to us it seemed like poetry in granite. 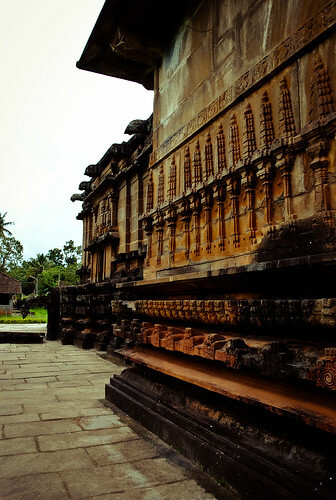 The intricate carvings, the beautiful statues and the pyramid like structure of the temples were the salient features. It’s a beautiful monument and a must visit if you are anywhere near the Jog falls. What does the package with Eco escapes cover ? 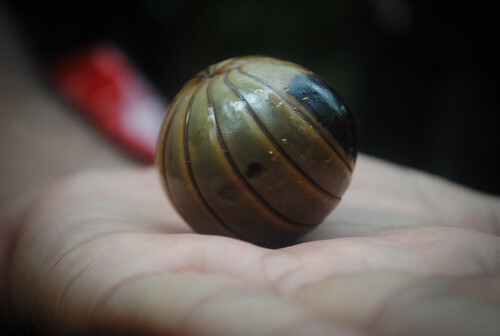 @Deguide: The package covered the pickup and drop from Sagara, local transport in a Jeep, Sight seeing, all gear, guide and activities; delicious food 3 times a day plus morning tea and evening snacks. This included a barbecue dinner! All this for Rs 2800/- per person.